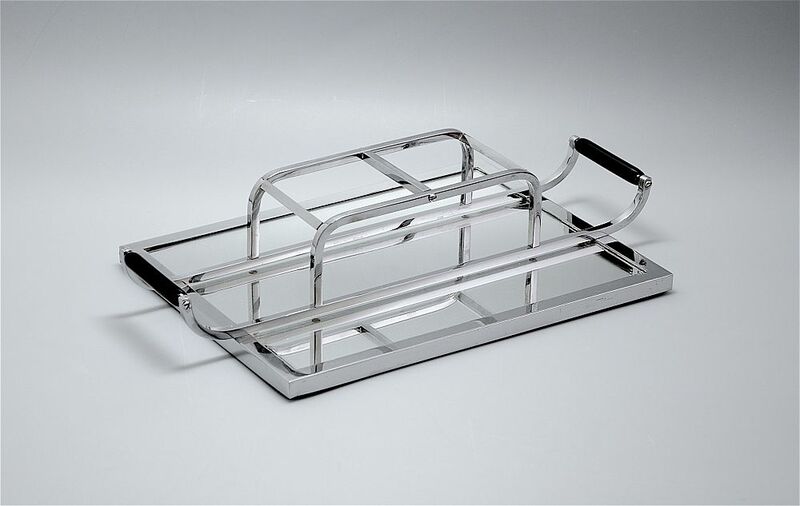 This superb tray/decanter stand was designed by Jacques Adnet in France during the Art Deco period. The mirrored glass base has a rectangular chrome frame with small pyramid feet. In the centre of the base is a sledge like chrome framed centre piece the ends of which extend beyond each side of the base and have black handles that appear to be made of bakelite. The centre piece would probably have been for 2 decanters. A fabulously stylish modernist piece. French Art Deco modernist designer, architect & interior designer known for his furniture designs in leather. He attended the Municipal School of Design in Auxerre & the Ecole des Beaux-arts Paris. Until the age of 28, he lived and worked with his twin brother Jean at the Studio La Maitrise, where they met the Art Déco designer Maurice Dufrene. Adnet exhibited at the 1925 Exposition Internationale des Arts Decoratifs et Industriels Modernes. From 1928 to 1960, he directed La Compagnie des Arts Francais (CAF). His team of decorators included Francois Jourdain, Charlotte Perriand & Georges Jouve. CAF provided Adnet with an ideal platform from which to promote his modernist designs. These incorporated precious woods, chromed metals, embellishments such as mirror, leather, parchment and smoked glass in linear styles with pared away decoration. From 1947 – 1949 he was president of the Salon des Artistes Decorateurs. During the 1950s, he created furniture and concentrated on the numerous commissions he received, including the decoration of the private presidential apartments at the Elysee Palace and the meeting from at the UNESCO headquarters Paris. From1959 – 1970 he was the director of Ecole Nationale Superieure des Arts Decoratifs in Paris.